Citation Information: J Clin Invest. 2007;117(2):438-447. https://doi.org/10.1172/JCI28844. Heme oxygenase–1 (HO-1, encoded by HMOX1) dampens inflammatory reactions via the catabolism of heme into CO, Fe, and biliverdin. 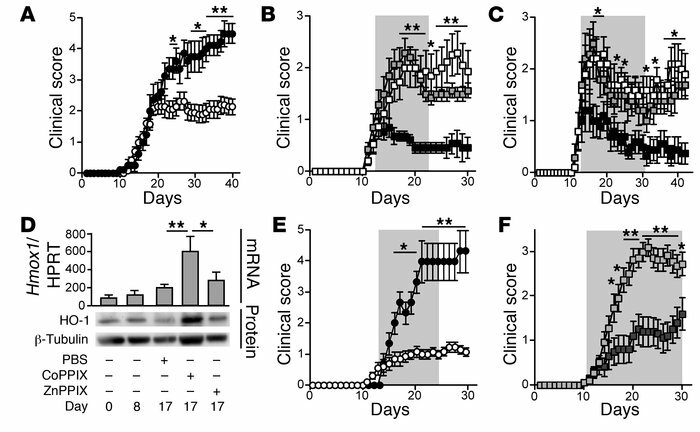 We report that expression of HO-1 dictates the pathologic outcome of experimental autoimmune encephalomyelitis (EAE), a model of multiple sclerosis (MS). Induction of EAE in Hmox1–/– C57BL/6 mice led to enhanced CNS demyelination, paralysis, and mortality, as compared with Hmox1+/+ mice. Induction of HO-1 by cobalt protoporphyrin IX (CoPPIX) administration after EAE onset reversed paralysis in C57BL/6 and SJL/J mice and disease relapse in SJL/J mice. These effects were not observed using zinc protoporphyrin IX, which does not induce HO-1. CoPPIX protection was abrogated in Hmox1–/– C57BL/6 mice, indicating that CoPPIX acts via HO-1 to suppress EAE progression. The protective effect of HO-1 was associated with inhibition of MHC class II expression by APCs and inhibition of Th and CD8 T cell accumulation, proliferation, and effector function within the CNS. Exogenous CO mimicked these effects, suggesting that CO contributes to the protective action of HO-1. In conclusion, HO-1 or exposure to its end product CO counters autoimmune neuroinflammation and thus might be used therapeutically to treat MS.
HO-1 and CO suppress EAE progression. EAE was induced, and disease severity was scored daily thereafter. Clinical scores are shown as mean ± SEM. (A) Progression of EAE in C57BL/6 Hmox1+/+ (open circles; n = 21) versus Hmox1–/– (filled circles; n = 8) mice. (B and C) C57BL/6 (B) or SJL/J (C) mice, randomized 2 days after EAE onset, were treated daily with PBS (open squares; n = 10–15), CoPPIX (filled squares; n = 10–14), or ZnPPIX (gray squares; n = 10–14). (D) C57BL/6 Hmox1+/+ mice were treated as in B. Hmox1 mRNA and protein expression in the CNS were assessed by quantitative RT-PCR and Western blotting, respectively. Hmox1 mRNA expression is shown as mean number of Hmox1 per HPRT mRNA molecules ± SD. (E) EAE was induced in C57BL/6 Hmox1+/+ (open circles; n = 12) and Hmox1–/– (filled circles; n = 3) mice treated with CoPPIX as in B. (F) EAE was induced in C57BL/6 Hmox1+/+ mice, randomized 10–12 days after immunization, and exposed to CO (450 ppm; dark gray squares; n = 20) or not (light gray squares; n = 22). Shaded areas indicate periods of designated treatment. *P < 0.05; **P < 0.01.